It sounds like a beginning of a joke—a statue, a mount, and a mannequin walked into a bar. . . . Sorry, I got none. But, that's what I happened to see last weekend in Aromas. Jenn and I drove through Aromas looking for a cafe or something to drink a cup of coffee before checking out the annual Open Studios Art Tour. We saw a store. 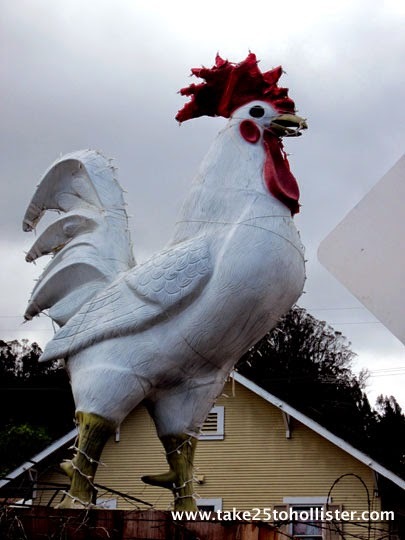 . . a huge statue of a chicken. . . the library. . . a farm supply store. . . the post office. . . cute houses. 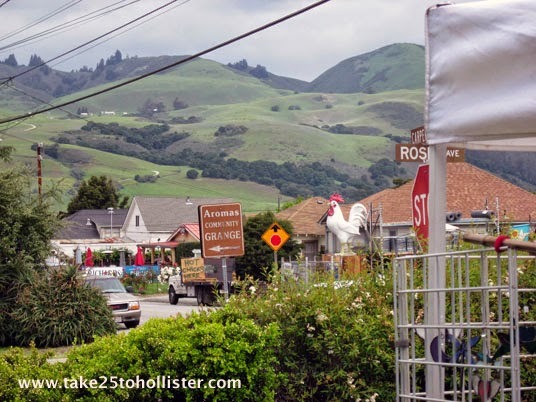 . . a sign pointing to the Aromas Community Grange. . . and more cute houses. We pulled up next to two women who were saying good-bye to each other. "Hello," we said. "Is there any place to have coffee around here?" "The restaurant up the street might," said the woman who lived in one of those cute houses. "But, I don't know how good the coffee is." "That's okay. 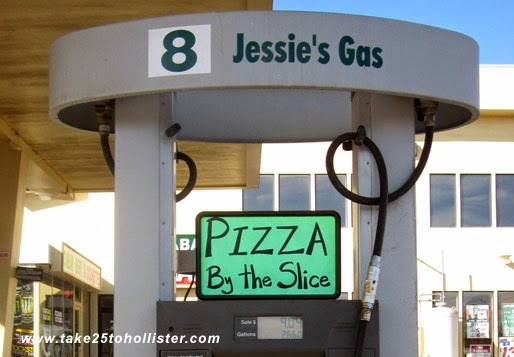 Is it the store with the gas station?" "No. A bit further up. On the left. If it's not open, come back, and I'll make you coffee." 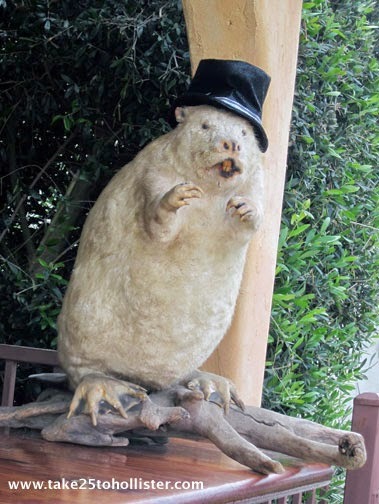 Needless to say, but I shall say it, dear Readers, the folks we met in Aromas that day were friendly, happy, and open-hearted. Aromas is an unincorporated town, part of which is in San Benito County and the other part is in Monterey County. 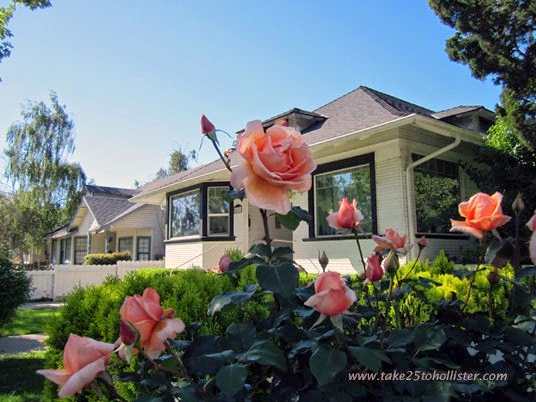 It also has the distinction of bordering both Santa Cruz and Santa Clara counties. Its population is about 2,700, with roughly half of the people living in either San Benito or Monterey counties. 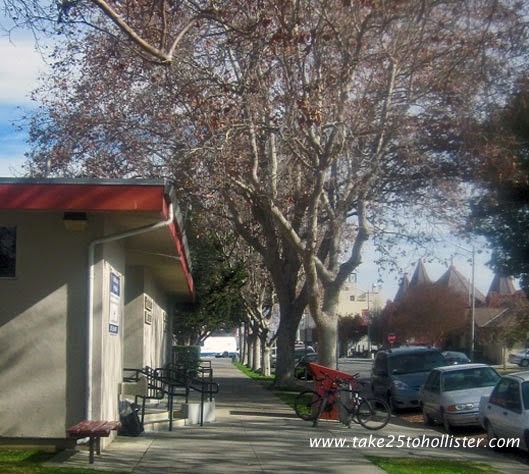 The elementary school is part of the San Juan-Aromas School Unified District in San Benito County. 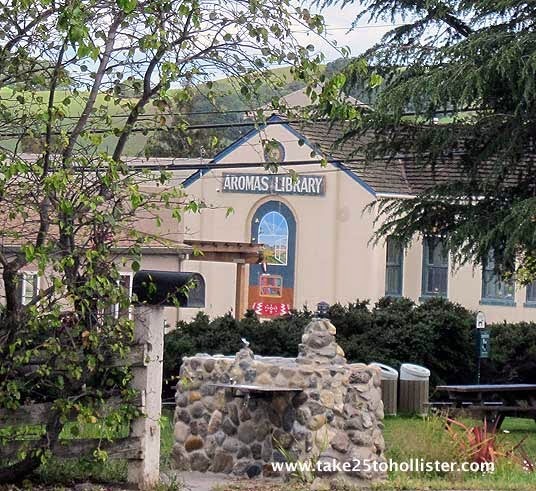 Its public library, however is part of the Monterey County Free Libraries. 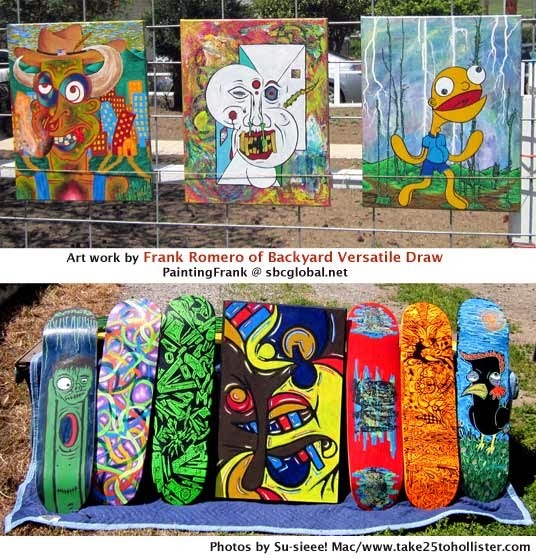 Frank Romero is another Aromas artist who showed some of his works in the Open Studios Art Tour this weekend, which was sponsored by the San Benito Arts Council. 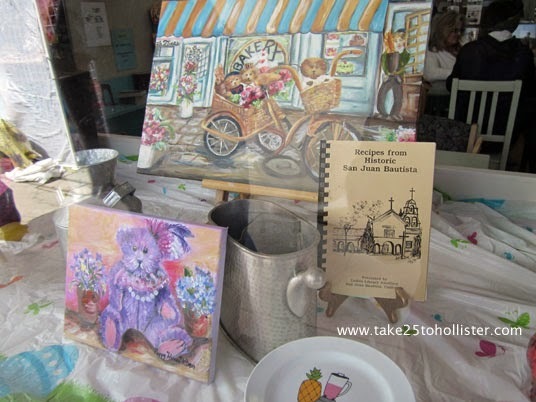 Yesterday's post showed works by two other Aromas artists. Here's that link. Aromas has a very strong artist community. To learn more, visit the Aromas Hills Artisans website. Today is the second day of the Open Studios Art Tour. 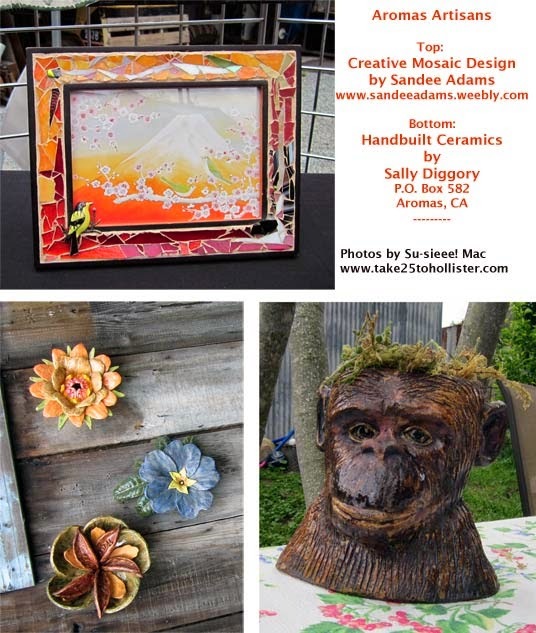 Artists in Hollister, Aromas, and San Juan Bautista invite one and all to visit them at their studios to view their works—paintings, prints, sculptures, jewelry, mosaics, and so on. It's from 10 AM to 4 PM. Head over to the San Benito Arts Council website for a map. A friend and I visited several of the artists in Aromas yesterday. Wish I had thought to take photos earlier. Yesterday, I posted something about Old Hernandez Road. 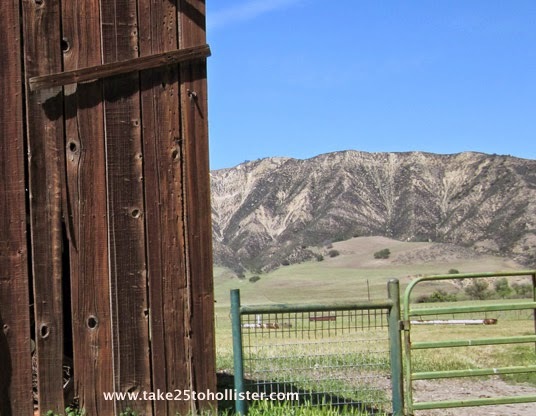 Today, you get a peek of the Diablo Range from Willow Creek Road. To get to these roads, you turn onto the San Benito Lateral, a very short road off the east side of Highway 25, a few miles south of the Pinnacles National Park. At the fork of the lateral is the former town site of San Benito. Go right, Old Hernandez Road. Go left, Willow Creek Road. Both roads come to a dead end, but they're still worth the jaunt if you like seeing awesome countryside and mountains. Once upon a time, the artist Thomas Kinkade owned property off of Willow Creek Road, which he called the Windemere Ranch. 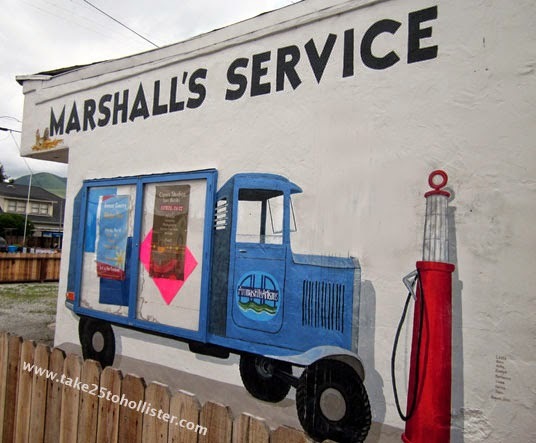 Want to see one of the paintings that Kinkade did of the area? Head over to this link to see the Windemere Ranch Sunset. 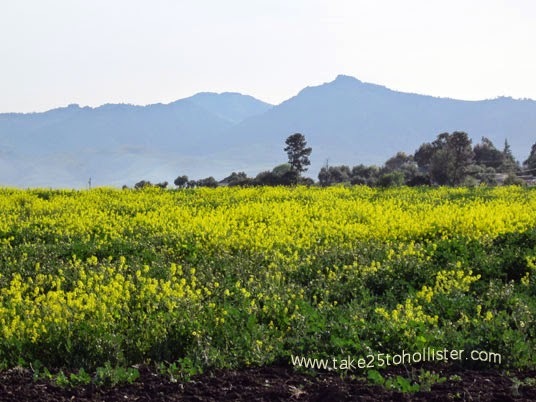 The other day the Husband and I drove as far as we could on the north end of Old Hernandez Road in the southern part of San Benito County. It was the first time for both of us. We were very amazed at the beautiful topography along that windy road. The expanse of the valley floor and the diversity of the Diablo Range above it, from rugged jaggedness to sudden badlands to something in between. 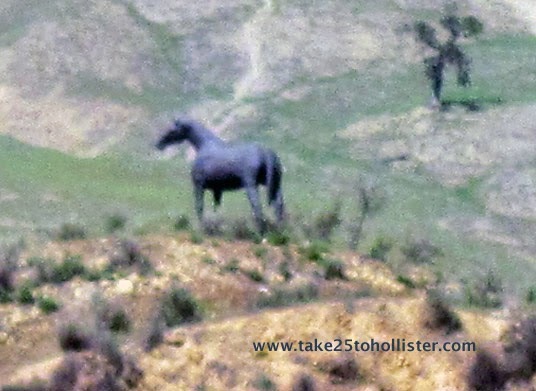 One of the surprising sights was the statue of a horse on a hilltop. At first glance, I thought it was a rather huge horse standing still. Does anyone know anything about the statue? 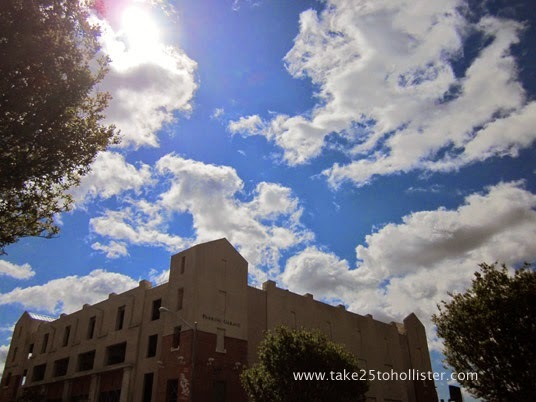 Quite a lot of fluffy clouds were passing through the other day. Hopefully some of them joined forces and made rain when the reached the Sierras. Yup, it's a beautiful view. 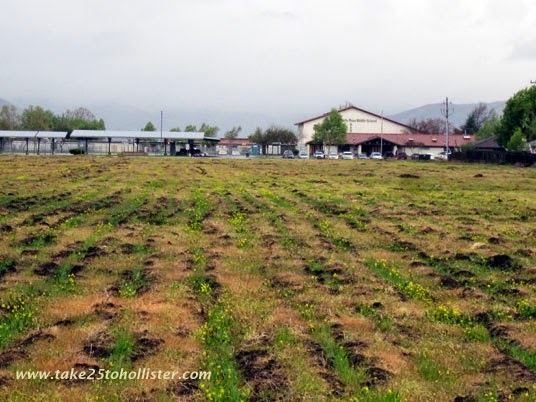 This field borders the whale park at the east end of Valley View Road. 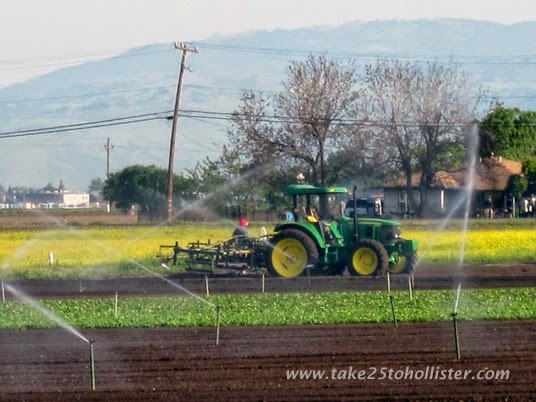 It's morning irrigation on farm land between Meridian Street and Santa Ana Road, only a few miles from downtown Hollister. It's wonderful to see, don't you agree? 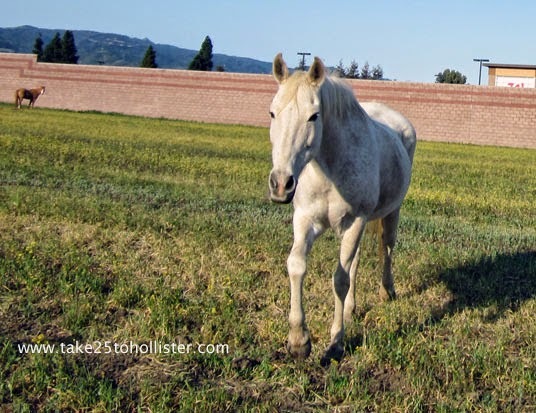 Two horses snacking on the grass behind the Highway 25 sound wall was a very cool sight yesterday morning when I was riding my bicycle. Of course, I had to pull over to take a photo. Both horses turned to look at me. "Who's that?" they seemed to say. 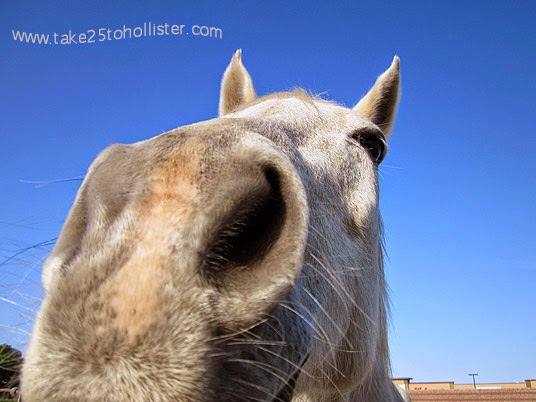 The white horse came over to greet me, probably thinking I had some kind of yummy snack. When it realized that I was just going to pet him, it went back to the grass. Peace and Joy to you, one and all, dear Take 25 to Hollister Readers! 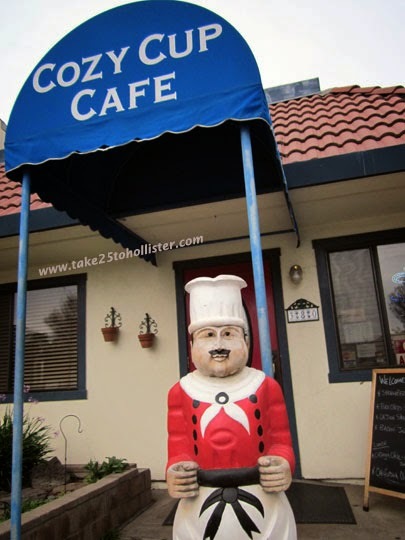 Owned by Chef Frank and Wendy Halayay, the Cozy Cup Cafe is a comfy place to eat where generous portions of delicious food is served with good cheer. You'll find it at 380 Fourth Street, conveniently located near the new California Superior Court of San Benito County and many of the San Benito County offices. The restaurant is open for breakfast and lunch. For more info, call 831-637-3730. 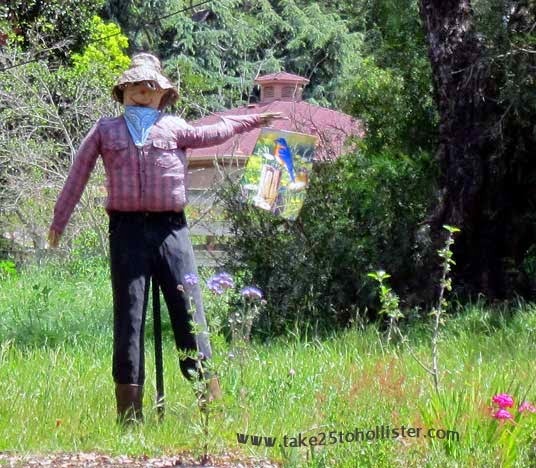 This El Camino Real Bell stands in the front yard of the Native Daughters of the Golden West Adobe at 203 Fourth Street in San Juan Bautista. Cast from a mold of an original El Camino Real bell, it was dedicated in 2010, the year that "The Gold Dust Girls" of Parlor No. 179 celebrated its 100th anniversary. El Camino Real was the foot path that the Spanish padres took between the California Missions, from San Diego to Sonoma. 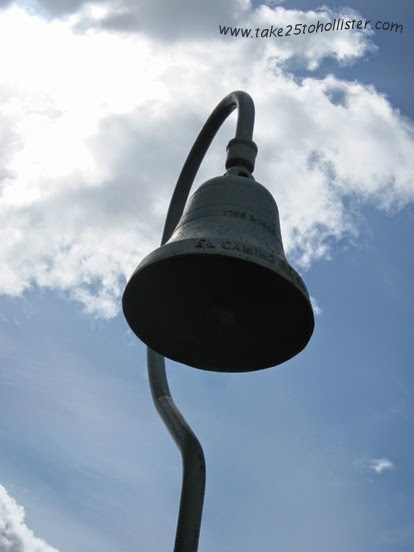 In the early 1900s, bells were erected every one to two miles to mark this historical route as well as to promote tourism in the state. By 1914, over 400 markers were placed. It's only recently that I noticed that most, if not all, gas stations in town have some kind of shop where you can purchase snacks. That's good to know when you're in a hurry and hungry. What Does It Resemble to You? 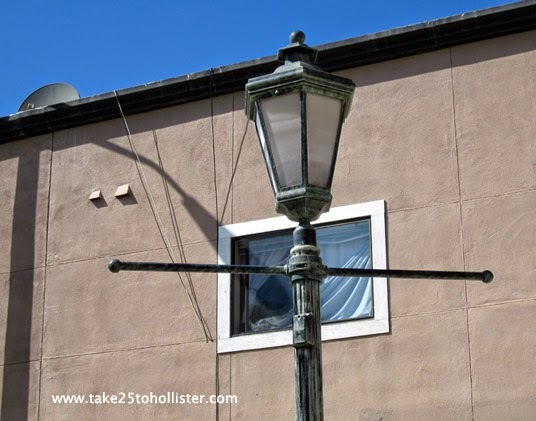 Does anyone else see the resemblance of the lamp section of the lamp posts downtown to Marvin the Martian? And, no, I wasn't drunk when I looked at the lamp post in front of the Veterans' Memorial Building on Sunday afternoon. But, I was under the influence of all that great music I had just heard, which was performed by the Watsonville Community Band. Isn't it such a bummer when you find out too late about an event? Or, you didn't even know the event happened until much later? For instance, did you know the San Benito Olive Festival was last October or that the Hollister Airshow will be on June 14 and 15, 2014? Without a daily local newspaper to tell us about upcoming events, we're on our own to find out. Difficult? Not really, once we have an idea where to look. 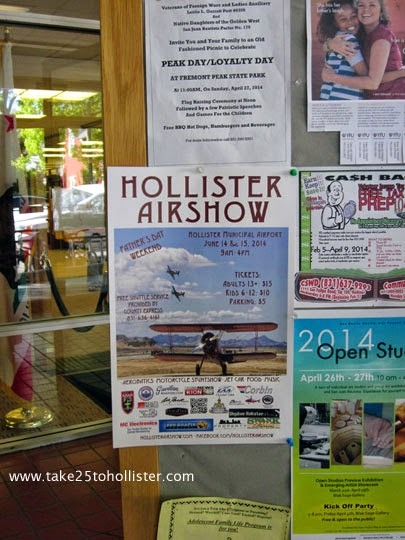 Did you know that our weekly newspaper—the Hollister Free Lance—has an online calendar? You can check it out anytime. No subscription is needed. Here's the link. An even better online source for local happenings, as well as breaking news, is BenitoLink. It reminds me of what the Free Lance used to be when it was a daily paper once upon a time. Here's the BenitoLink site. Facebook is another good source to learn about events. 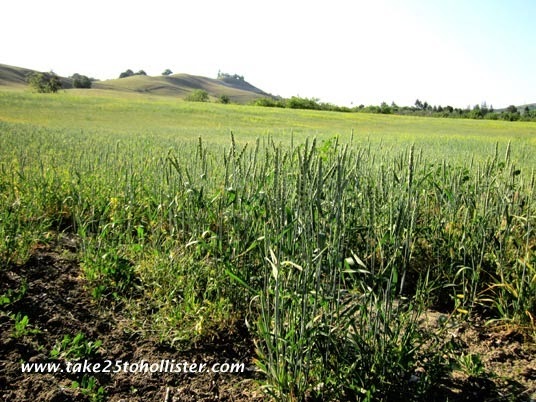 For example, at the Take 25 to Hollister Facebook page, I post links to upcoming events as I happen to come across them. Here's that link. And, of course, don't forget to check the bulletin boards at the libraries, supermarkets, and shops. What sources do you use to find out about upcoming events in our area? This week, April 14 to 18, our local library—the San Benito County Free Library—is celebrating two events. One is our library's 97th Anniversary. Whooo-hooo! The other is the 2014 National Library Week. Many fun, free activities are scheduled over the next few days. Today, April 14: Customer and Volunteer Appreciation Day! 11 AM to 3 PM: Anniversary Cake will be served to library patrons. 2 to 2:45 PM: Youth Financial Literacy Workshop. Door prizes and swag bags will be given out to teen participants. 2 pm and 5 pm: Movie and Popcorn. The movie Frozen will be shown. Seating is limited. 2 to 5:30 pm: Techie Toybox. Patrons are invited to play with ipads, iphones, and Kindle Fire work. 3:30 to 5:30 PM: Kid's Fun Day! Children's games and crafts will be featured, along with a chance to win a free book. 5 to 7 pm: Author Talks will feature local authors, Renette Torres (Widow's Peak) and John E. Chadwell (Werewolves of New Idria). Light refreshments will be served. Again, all activities are free. The library is located at 470 Fifth Street, near the corner of West Street. For more details, visit the San Benito County Free Library website or the Friends of the Library Facebook Page, or call 831-636-4107. 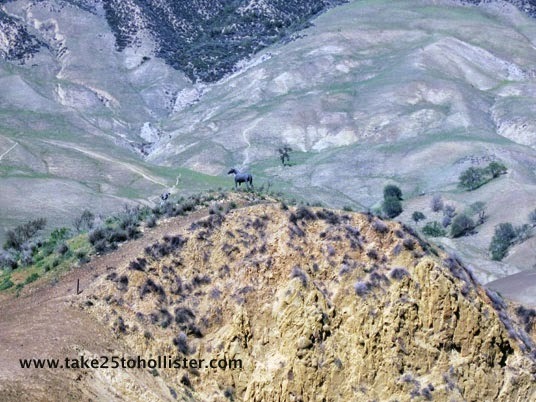 Every weekend hundreds of off-road enthusiasts drive their trucks, carrying or hauling dirt bikes and ATVs up Cienega Road to the Hollister Hills State Vehicle Recreation Area. Individuals, families, and groups come from all over the state for fun-filled rrrrrroarrrrrring up and down the Gabilan slopes. The park was originally the Harris Ranch, owned by Howard Harris. He built many of the trails for ranching, mining, recreation, and other purposes. For many years Harris operated a private motorcycle park. In 1975 he sold his property to the state and, in October of that year, the first state vehicle recreation area park was opened. The San Juan Bakery on 3rd Street in San Juan Bautista is a local pleasure. All sorts of breads, cookies, pies, and treats are made in the kitchen in the back. Many young fogeys, such as myself, are happy that the current owners are using the original recipes. Yum! By the way, isn't the bakery's window display cute? As I turned from taking photos of the gorgeous blossoms in front of City Hall, I spied the happy sign across the street. 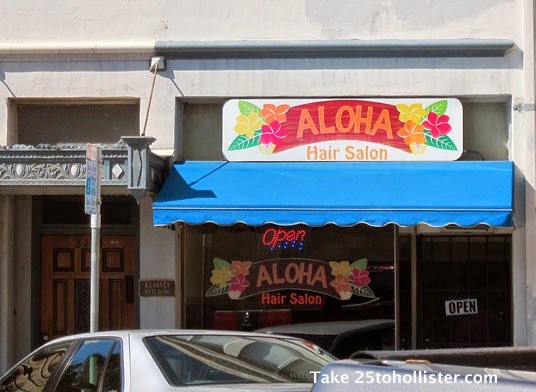 Aloha Hair Salon. The new business is next door to the Granada Theater on Fifth Street. 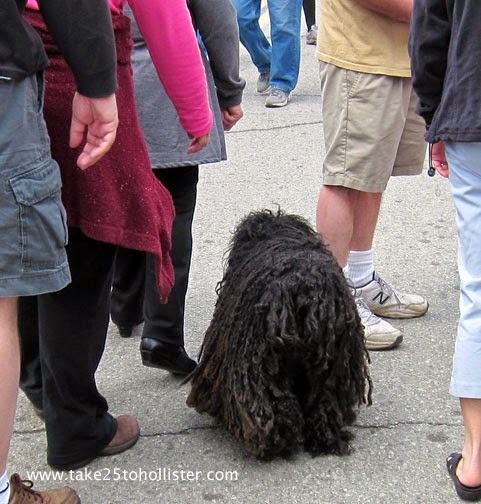 This cute dog was mopping up a lot of attention as he walked through the San Juan Bautista Fine Arts and Quality Crafts Festival a couple of weeks ago. Anyone else think he (or she) was sporting dreadlocks? 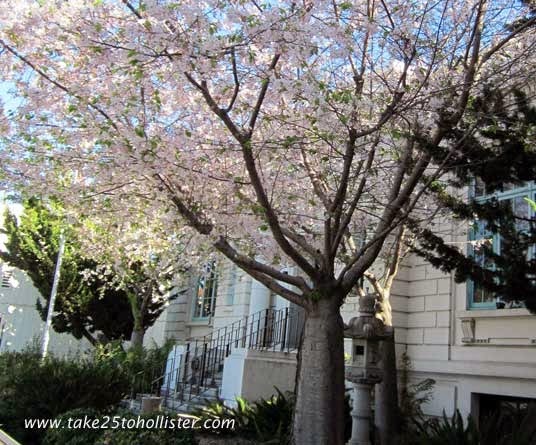 The trees in front of the City Hall are in blossom right now. They're more gorgeous in person. Check them out, if you can. 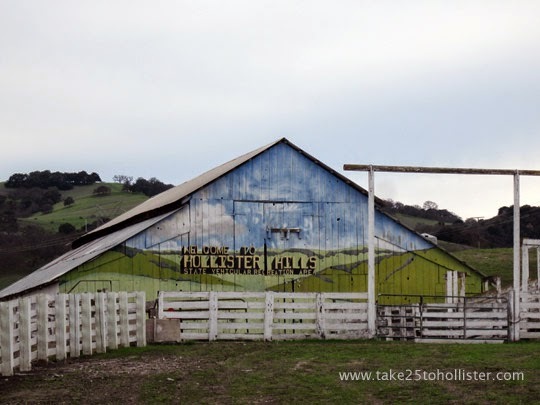 Don't you just love how the Hollister Hills SVRA painted their barn? The church on the southwest corner of Monterey and Sixth Street was built around 1883 as the First Presbyterian Church. 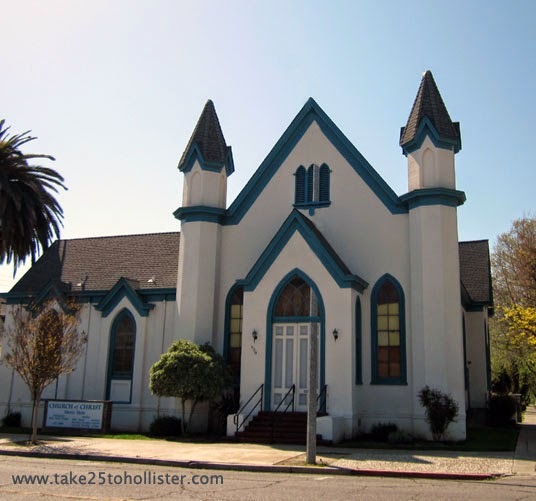 Today, it is the Hollister Church of Christ. The (southern) wing was added to the church in 1929, as well as the wooden stucture was plastered in stucco. The two towers have always intrigued me. I wonder if it's possible to get up into the towers, if there were once windows in the towers, and if bells used to toll from them. This past week I won one of Julie's Bundt Cakes in a fundraiser raffle at one of the elementary schools. It was winner's choice, so I asked for a lemon cake with chocolate frosting. Julie said it was an uncommon combination, then joked, "I hold no responsibility if it doesn't work." 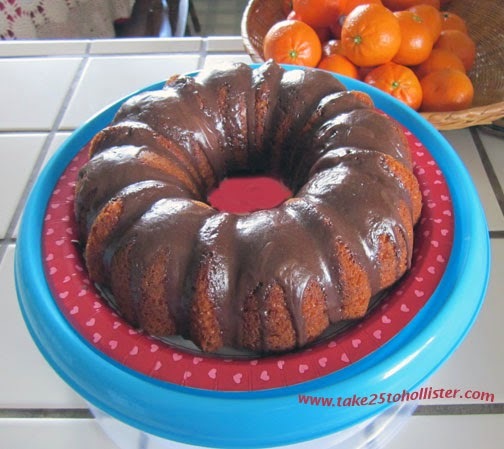 The combination worked deliciously well, thank you very much, Julie's Bundt Cakes, especially on the second day when the flavors settled in. Some, if not many, of you local readers, may know Julie. Julie Englehardt, that is. She is quite an enterprising creative lady. Not only does she make bundt cakes for sale--award-winning I might add--but she also offers tea-time parties to celebrate birthdays and, as Julie puts it, "any time of the year." In addition, this freelance writer and substitute teacher, is the owner and creative director of Story Time Adventures. Along with giving themed storybook readings to children, Julie performs as Ms. Bunny and Mrs. Claus, and as these characters will write letters and make phone calls to children. To learn more about Julie and her products and services, check out her pages at Facebook. Note to FCC: I did not receive any compensation for writing this post, unless winning the bundt cake in the fundraising raffle counts. Yup. 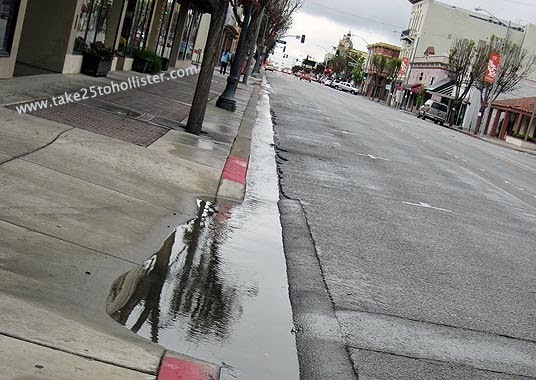 I even enjoy watching the rainwater flow down the street. When we were kids, we used to find worms in the gutter after a rain. We'd pick them up and throw them at each other as we waited for the school bus to pick us up and take us to Sunnyslope School. Ah, sweet memories. 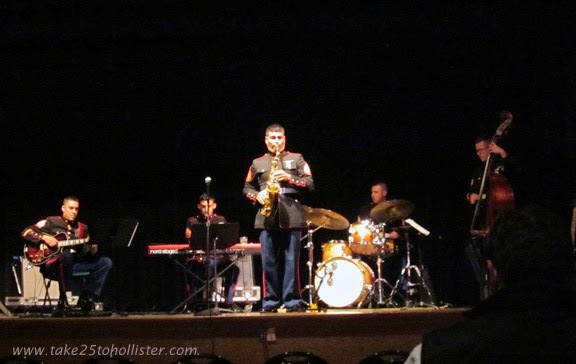 Musical magic came to Hollister last night in the form of the Marine Corps Band Jazz Combo from San Diego, particularly in the performance by the saxophonist, Sgt. Charlie Arbelaez. Oorah! Here's a video of the Jazz Combo playing Caravan. I have no idea of the date or location of the performance, but it gives you an idea of last night's wonder. Along with Sgt. Arbelaez, the guitarist in the video was also one of last night's performers. By the way, the Baler Band started off the evening. I tell you, we have a lot of young talented musicians living in our town. If you'd like to hear some of them, check out the County-Wide Music Festival tonight at 7 PM at the San Benito High School Mattson Gym. The free concert will feature the elementary, middle, and high school bands. That's right! Free music concerts will be happening in Hollister over the next two weeks. Three of them. And, each concert is free. So, no complaining about there being nothing to do in our town. You can complain that you wish you had known sooner. But, not to me. Tonight the Marine Corps Jazz Band will be performing at the Veterans' Memorial Building on the corner of San Benito and Seventh Streets. Time: 5:30 PM. For more details, check out Mr. O's Jazz Band Facebook page. The County-wide Music Festival featuring the elementary, middle, and high schools bands in San Benito County will be taking place tomorrow evening (Thursday, April 3) at 7 PM at San Benito High School. It will be held in the Mattson Gym, which is on the corner of Monterey Street and Nash Road. Mr. O's Jazz Band will also be performing at the festival. 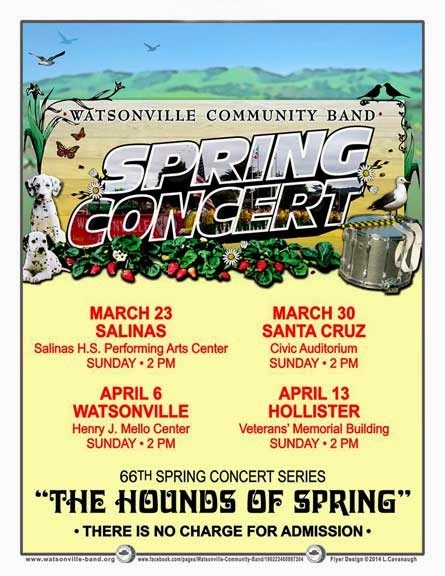 This year, the Watsonville Community Band is performing its 66th Spring Concert Series -- The Hounds of Spring -- throughout the Central Coast. 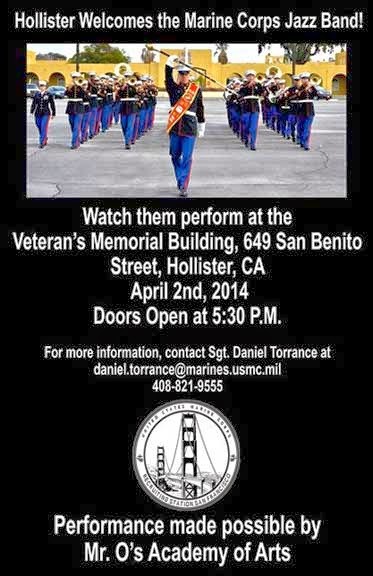 The band will be in Hollister on Sunday, April 13 at 2 PM in the Veterans' Memorial Building. The band's members come from Santa Cruz, Monterey, San Benito, and Santa Clara counties. For more about the Watsonville Community Band, head over to its web site or its Facebook page. The last orchard on Hillcrest Road is gone. Once upon a time -- at least when I was a kid -- apricot, walnut, and other fruit orchards stood on both sides of Hillcrest, all the way up to Fairview Road. I'm glad I got to experience it.